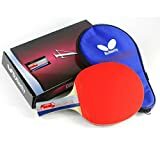 The Butterfly 401 Table Tennis Racket Set is a professional quality ping pong paddle with a free ping pong paddle case in a gift box that is perfect for any occasion. This high value ping pong racket will give you a good mix of spin, speed, and control for competitive ping pong games. It is the perfect table tennis racket for all levels of play. The table tennis rubber is red on the forehand side and black on the backhand side of the ping pong paddle. It is assembled with Yuki 2.1mm rubber that is approved by the International Table Tennis Federation for ping pong tournaments. The table tennis rubber and sponge layer provides a spring action and extra tackiness for adding spin when striking the ping pong ball to help you smash your ping pong opponent. The ping pong racket is the traditional shakehand style with a flared table tennis grip that is wider at the bottom. This provides superior grip and comfort when playing long competitive ping pong games. A full ping pong paddle case is included to protect your racket from harmful elements. Butterfly table tennis paddles come with a 30 day manufacturer warranty. 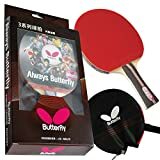 Butterfly table tennis rackets are the preferred rackets of professional table tennis players around the world. The STIGA Supreme is a performance-level table tennis racket featuring ITTF approved rubber for tournament play. The Supreme racket has an anatomic Italian composite handle, 6-ply extra light blade, 2mm sponge, and future inverted rubber. Performance ratings for the Supreme are 90 for speed, 92 for spin, and 89 for control. STIGA - Play the Best! The STIGA Reflex is an entry level racket that is perfect for the recreational level table tennis player. The lower spin and speed ratings for this racket make it a great choice for the player that is still building skills. This racket is great for kids and is the perfect accessory for your rec room table tennis table. 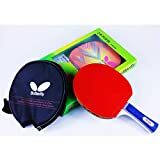 The Butterfly 302 Table Tennis Racket Set is a professional quality ping pong paddle and ping pong paddle case in a gift box perfect for any occasion. 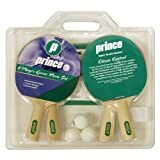 This high value ping pong racket will give you a good mix of spin, speed, and control for beginner to intermediate ping pong players. The table tennis rubber is red on the forehand side and black on the backhand side. It is assembled with Yuki 2.1mm table tennis rubber that is approved by the International Table Tennis Federation for table tennis tournament play. The ping pong rubber and sponge layer provides a springy feel and is sticky for increased spins to help you smash ping pong balls at your ping pong opponent. The table tennis racket is the traditional shakehand style with a flared grip, which is wider at the bottom. This provides superior grip and comfort for your ping pong competitions. The Butterfly table tennis racket case is included to protect your ping pong paddle rubber from harmful elements and prolong the stickiness and life. Butterfly table tennis paddles come with a 30 day manufacturer warranty. Butterfly table tennis rackets are the preferred rackets of professional table tennis players around the world. Give your ping pong game speed and spin with the Butterfly 302 Ping Pong Paddle. Designed for optimal speed and spin, the Titan table tennis racket from STIGA sports a 2-millimeter inverted rubber sponge, a 5-ply extra-light blade, and a concave Italian composite handle. The tournament-quality rubber is approved by the International Table Tennis Federation. The racket also includes STIGA's unique Crystal Technology, which hardens the surface of the blade, resulting in increased speed. STIGA – Play the Best! The STIGA Apex Table Tennis Racket is a performance-level table tennis racket for competitive table tennis play with family and friends. The Apex racket features ITTF approved drive inverted rubber and STIGA ACS Technology, microscopic air capsules in ultralight rubber for maximum elasticity and outstanding control. The Apex also includes WRB Technology for increased blade balance, recovery rate, and ball sensitivity. Featuring a 5-ply extra light blade, 2mm sponge, and a concave Italian composite handle, the Apex offers performance ratings of: speed – 65, spin – 52, and control – 80.